Where can I get lumber in Harvest Moon: Hero of Leaf Valley? That is a question that players often ask when first playing this game. Yes, I often find such questions in many forums. You probably already know that lumber is used to upgrade buildings on your farm, especially your house. So, it is very important to get these lumber. Therefore, in this article, I will explain clearly how to easily get many lumber in HM: HoLV. Closed on Tuesdays, Thursdays, and rainy days. Go to Woody's Carpentry and talk to Woody. Later, you will be teleported to a place where you can cut trees using an Axe. The first time you work, you will not get a single lumber because the lumber you get will be given to Woody. As a replacement, he will only give you money as a wage. But after you work 5th times, he will allow you to pick up the lumber to upgrade your house. So when you work 6th times to cut the tree, you can get lumber. Keep in mind that Woody does not allow you to cut trees every day. For example, after you work today, you have to wait a minimum 3 days to cut down the tree again. Tips: the trees will get bigger and produce more lumber if you wait longer, eg, 5 days instead of 3 days. Though you'll need several more cuts (like 5 times instead of 3). Secret: If you give Woody a golden egg, he will take you to his secret spot for lumber farming! You also have to bring food that can restore your energy, such as honey and herbal drinks. This is important because every time you cut a tree, your stamina will continue to decrease rapidly. Especially if your stamina is still short because you have not get the Power Berry to increase it. Every single season, there will be a horse race in Leaf Valley, except Winter. In the horse racing event, you can do horse racing bets. Use your money to buy some medals for betting. Click the triangle button to buy medals on the store in the race area. If the man from the race asks you to pick a bet and then it will show how many medals you would like to buy. 1 medal costs 50 G.
Here, you have to guess which rider will win the race. If you win, you will get many medals that are multiplied by the ODDS of the horse racer. The medals you earn from bets can be redeemed with lumber, 2 medals for 1 lumber. So if you have 900 medals, you can trade it for 450 lumbers!. With this way, you do not need to work anymore to cut down trees in Woody's logging area. Even so, this way is quite risky. If you lose, you will lose all your money. Few tips, I find that smaller ODDS racers will often win than the higher ones. For example, a racer who has 10 ODDS will often finish on 3 or 4 positions. But it's not always like that, so please try it yourself. 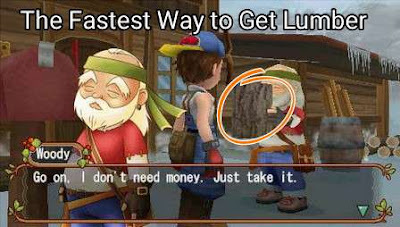 That's How to Get Lumber in Harvest Moon: Hero of Leaf Valley. I hope this article can be useful for you who need it.